Compact yet stylish, this storage cabinet has unique details to stand out. The cabinet has two drawers and two doors that open up to reveal shelving. The two doors feature copper panels that have engraved renderings of wheat and frames. Don't settle for boring cabinets when you can have practical and stylish options like this one! There are two drawers and shelving inside the compartment doors for storage. The two doors feature glass panels with understated and attractive patterns that evoke art deco pieces or Frank Lloyd Wright. Perhaps the most simple and timeless of the Arts & Crafts cabinets, this option works well as a piece that is being added to a decorated home rather than a standalone piece. The two doors feature classic in-laid panels drawing attention to the shape and handles of this cabinet. The Caledonia Storage Cabinet will not only add beauty and elegance to your kitchen, bar, or dining area, it will add more serving, dinnerware, and leaf storage space. Match this cabinet with our existing line of matching tables and chairs, or buy alone. The top quality Amish craftsmanship will astonish you and your guests. This cabinet can store up to eight leaves with skirts. If drawers are eliminated, 12 leaves with skirts can be stored. Wine rack is optional, but can store four leaves with skirts below rack. - If wine rack is added cabinet will be 42"h rather than 48", and shelves will be moved top. Customize your cabinet with options in our drop-down boxes (shown top right). 100% Amish hand-crafted with 100% hard wood! The Colbran Storage Cabinet will not only add beauty and elegance to your kitchen, bar, or dining area, it will add more serving, dinnerware, and leaf storage space. Match this cabinet with our existing line of matching tables and chairs, or buy alone. The top quality Amish craftsmanship will astonish you and your guests. 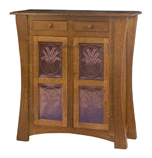 Transofrm your home into a beautiful art deco space with this cabinet. 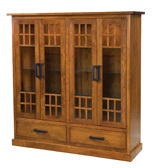 The Colebrook storage cabinet has one large cabinet and two drawers to organize your belongings. The doors show off glass panels with vintage inspired artwork. The sideboard has metal handles and knobs that are complemented by the black stained pattern. This stylish storage cabinet has lots of storage space for your home with two drawers and two cabinetswith shelving inside. The doors to the cabinets have glass panels with a modern design of color and shapes. The Crestline line of furniture is known for its cool, effortless and classic style. perfectly! Pictured in quarter sawn white oak with Asbury Brown stain. Door Opening: 26" x 43"
The McCoy Storage Cabinet will not only add beauty and elegance to your kitchen, bar, or dining area, it will add more serving, dinnerware, and leaf storage space. The top quality Amish craftsmanship will astonish you and your guests. Choose an attractive stand-alone closet or cabinet and elevate the style in your home. The McCoy storage cabinet has one large compartment and two smaller drawers to organize your belongings. The sides of this cabinet have in-laid panels and the doors have copper panels with engravings of wheat to add a traditional twist as well. Combine traditional design with modern angles with this playful storage cabinet. All of the McCoy storage cabinets have one large compartment and two smaller drawers to organize your belongings. But this cabinet has in-laid panels and doors with art-deco inspired designs on its glass panels. Combine traditional sensibilities with modern angles and you'll have this beautiful storage cabinet. All of the McCoy storage cabinets have one large compartment and two smaller drawers to organize your belongings. The sides and doors of this cabinet have in-laid panels that emphasize the beautiful natural grain of the wood. This beautiful and slender cabinet is ideal for homes that need just a little bit more storage space. 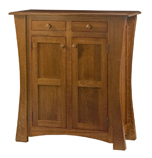 This cabinet has a solid wood door with inset panels that show off the natural wood grain. There are other varieties in this family of products if you would like other options. This medium-sized storage cabinet is great for any room of your home where you need a little extra space. This cabinet has one large compartment enclosed by one door as well as one drawer to organize your belongings—whether it is clothes, guest coats or even a catch-all for games, books and toys. The door has three copper panels with wheat engravings for a traditional touch of style. 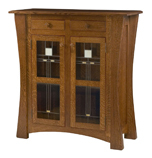 The Modesto family of furniture exemplifies the Mission-style and appeals both to all tastes with its elegant design. This beautiful cabinet has one large compartment enclosed by one door as well as one drawer to organize your things. It will make other shelving look sad in comparison! The door has glass panels with an art deco-inspired design. The Modesto family of furniture exemplifies the Mission-style and appeals both to all tastes with its elegant design. This large storage cabinet is great for any room of your home where you need extra space for clothes, books or handy items. The two doors have copper panels with wheat engravings for a rustic, traditional touch. Being the larger version of a 1-door cabinet, this 2-door cabinet has even more storage space for your belongings. It also has more stylish details, especially in its flared leg accents. The two doors have art deco-inspired designs in their glass panels. Whether you need storage for household items, kid's toys or something else, this solid wood option is one of the most elegant options available. It's a timeless and classic cabinet with two doors, multiple wooden shelves and oversized tapered legs.The two doors have timeless in-laid panels. If you’d like a cabinet that doesn’t take up a lot of space in your home, the Pottery storage cabinet is ideal. This cabinet has two drawers, three compartments and a ledge to store your belongings. One of the cabinets has a glass door, glass shelves and a light inside to show off your favorite items.